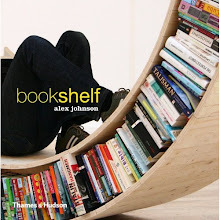 Some people sort their books alphabetically by title or author, others according to the theme or style, while still others base the organization on color or size. There is no ideal system as organizing based on the one perspective always causes chaos in terms of the other. kaos makes productive use of this disorder: books are stored in little groups, which makes it possible for various organizing systems to exist alongside one another. The result is a three-dimensional picture composed of books – unpredictable and, by principle, chaotic. Variously shaped shelves are mounted onto a base board. The arrangement as 90 degree angles renders the structure stable and able to withstand heavy loads. kaos should ideally be mounted on the wall. I surely prefere 90 degrees angles. 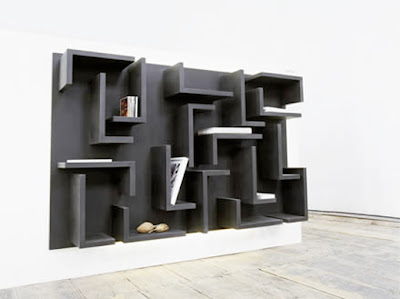 Don´t like those shelves where the shelves slant some degrees in angles to the right or to the left.